Whenever I do an arts and crafts project, I, one, feel like my mother and, two, wish I had a room specifically for doing my projects. The dining room table is a great space, but I have done such damage to that guy, thank god for sanding a varnish. This project took place on that table and was for my most recent niece’s first birthday. I always try to do some sort of crafty item for each of my nieces and nephews when I can. They get some many toys from the rest of the family and friends, that I want to make something special. I always give them a personalized step stool for their first Christmas, but I saw this idea for quilling and I though it would be perfect for the spot above Emily’s crib. 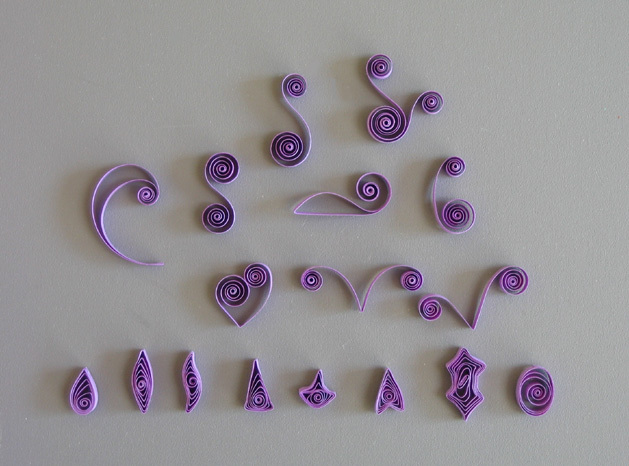 Quilling is a skill that is developed with a lot of practice. I realized this as soon as I started this process. The projects that I have seen are so intricate and time consuming that they made my final project look novice, but in reality, it is. I stared by collecting all my supplies. 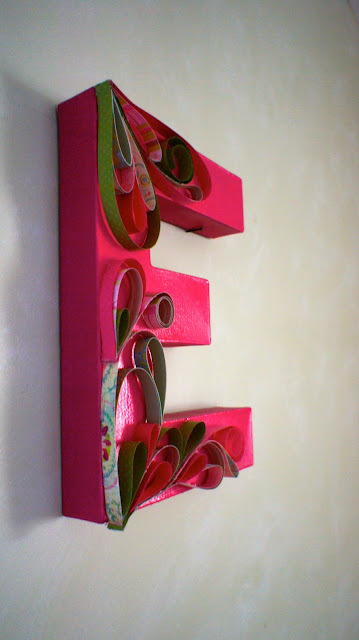 A three dimension letter (E), spray paint, card stock, paper cutter, and hot glue gun. 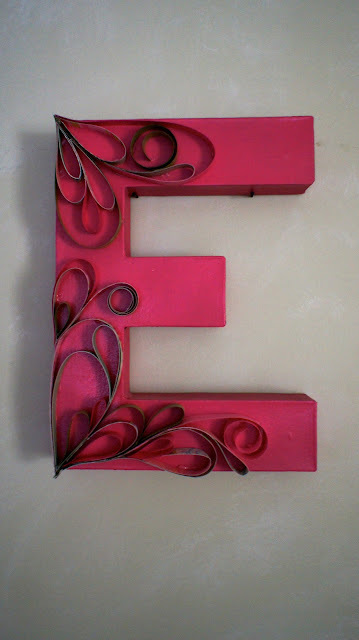 First, I spray pained the letter. 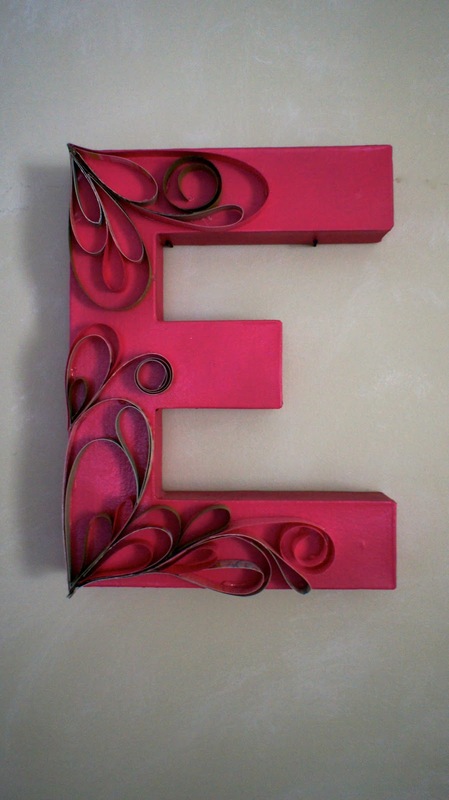 I bought it at Michaels pretty cheap and spray pained it pink at the same time I sprayed Emily's stool. Pink was the color of choice because I had already done purple for my first niece, Cailyn. I already had card stock that I had used for some photo albums so I chose anything with pinks and greens. There were a bunch of paisley combos with my colors and stripes and polka dots with pinks and greens. I was lucky to already have these, but you can buy these prints one page at a time from your local craft store for about $1 each. I used my paper cutter to cut the paper into into 1/2 in strips. I don’t think cutting the paper by hand would work. You need the straight lines to lay against the flat section and you want the other perspectives to look symmetrical. 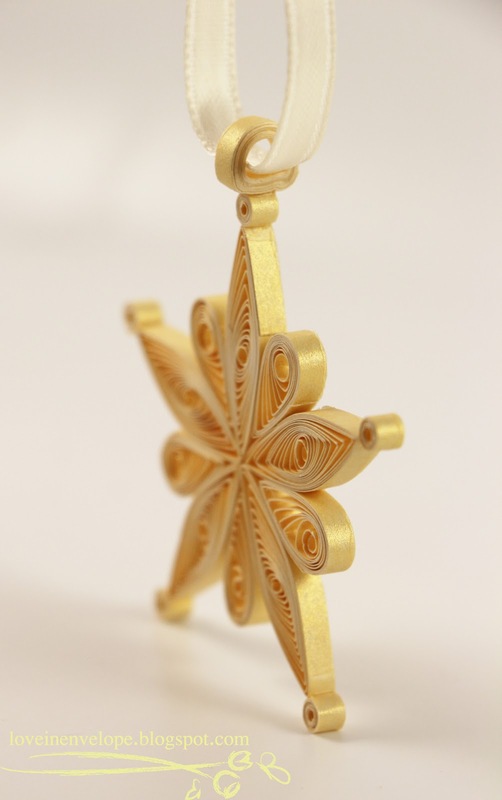 Paper cutters range from $15 and up. Once you own one, you use it for more than you realized. It is worth the investment. The rest of the process was all new to me. I used pictures I had from the computer to make my various shapes. I stuck with teardrops and scrolls because they were what I could handle, but there are so many shapes that you can make using practiced techniques. I used my hot glue gun and definitely burnt myself a few times. It is not recommended to use the hot glue gun, but my result made me and my family happy. I hope Emily has this for many years to come. I hadn’t started my blog yet and did not take any pictures of the process before I gave this gift to my niece for her first birthday. Over the holidays I remembers to go and take pictures, but Emily was sleeping which is the reason for the poor quality of the pictures. I didn't want to wake the sleeping baby. She was sleeping with her bum in the air. How freaking cute is that? Labels: Decor., DIY., Gifts., Home.